That Clinton Foundation Scandal the Press Wants Exists, But they Won’t Report it Because it’s Actually About the Trump Foundation. The entire national press and nearly 100% of cable news is ignoring a very real, easily proved, corruption scandal that is massively relevant to the presidential election. Trump made this substantial contribution to Bondi at just the moment when her office was evaluating whether to bring legal action against Trump’s ‘Trump University’ real estate seminar scam. Indeed, Bondi admits she reached out to Trump to solicit the contribution just as the decision was on her desk. She eventually declined to take legal action against Trump, overruling the recommendations of career investigators. A mounting legal case was also underway in Texas, by career investigators under then-Attorney General and now Governor Greg Abbott. Abbott overruled the investigator’s recommendation for legal action. Shortly thereafter Abbott got $35,000 from Trump. In this case Trump at least made the contribution without the commingling of nonprofit funds that got them in trouble in Florida. It’s recently come to light that these donations (bribes) were paid out of the Trump Foundation. Whether that was through deliberate intent or incompetence is immaterial, because this is an actual, real, meaningful scandal with two — two! — smoking guns. This is exactly the sort of thing that the New York Times, CNN, and all the biggest names in journalism are looking for as they relentlessly go after the Clinton Foundation, as well as Bill and Hillary Clinton. There is nothing to be uncovered there, because there is no “there” there. … but there is almost complete and utter silence about Trump’s two successful efforts to buy off politicians — and not just politicians, but the Attorneys General of two different states! Josh Marshall writes The New York Times appears to be revisiting its ‘whitewater’ glory days with its increasingly parodic coverage of the Clinton Foundation, and I think he’s right. The Times uniquely, though only as a leading example for the rest of the national press, has a decades’ long history of being lead around by rightwing opposition researchers into dead ends which amount to journalistic comedy — especially when it comes to the Clintons. But here, while all this is happening we have a real live specimen example of direct political and prosecutorial corruption, misuse of a 501c3 nonprofit and various efforts to conceal this corruption and the underlying corruption of Trump’s ‘Trump University’ real estate seminar scam. It’s all there — lightly reported here and there — but largely ignored. The story the media wants to write about the Clintons exists, but it looks more and more like it won’t be written, because it’s about Trump. I don’t think this is because the media is in the tank for either candidate, but is because there is a narrative: Trump’s a buffoon and dog bites man, while Clintons are just so damn suspicious and there’s a cloud over everything they do and whether it’s actually questionable or not, it sure has the appearance of being unethical. This isn’t really a horserace election, because even though we have a flawed candidate in Hillary Clinton, we have an absolute psychopath in Donald Trump. (Ezra Klein: “Crack open the polls, and they look even worse for Trump than the top-line results. That’s because Trump still is viewed as unfit for office on crucial metrics by big majorities of Americans.”) That’s a problem for cable news, because cable news needs a horserace. It’s the only way cable news knows how to fill all the time in the 24 hour cycle, and keep its advertisers happy. We recently saw that AP was more than happy to provide the something to help tighten the polls and create that horserace, by reaching a conclusion, doing reporting that didn’t support that conclusion, and rewriting the story and headlines to support their foregone conclusion. Cable news and most newspapers picked up on the AP’s story, and used to to raise a lot of ethical questions (to which the answer was “no, there’s nothing going on here”). It’s working, though. Since AP’s story broke, and the simple narrative it created was repeated all over the place, the race tightened. Paul Glastris wrote in the Washington Monthly that it’s a very good thing for media to heavily scrutinize anyone who wants to be president. I will add that anyone who wants to be president should welcome that scrutiny, because they are asking voters in America to invest a great deal of power and trust in them. 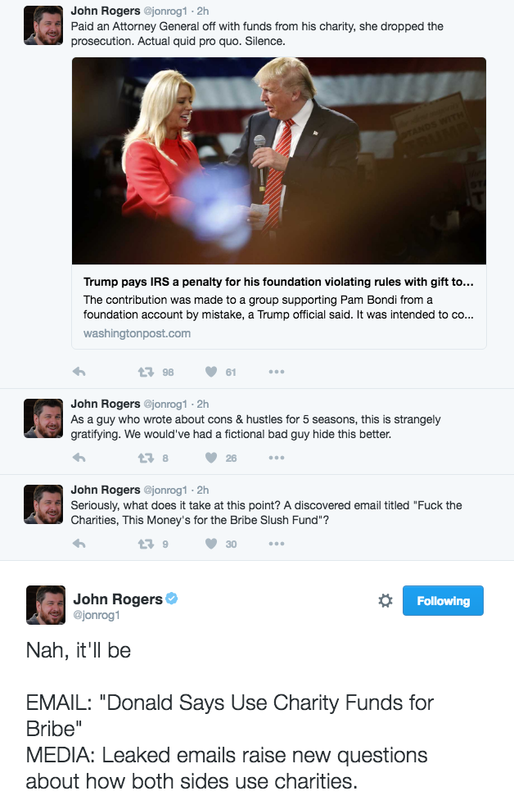 My friend John Rogers said what I’d been trying to say for days, before I wrote this post. The problem here is not just that our national political media and cable networks are substituting lazy both sideism for actual reporting, it’s that these media organizations, who we rely upon to inform us, are ignoring a real scandal that goes to the heart of not just who Donald Trump is, but how massively corrupted our pay-for-play political system is, and is instead focused like a laser on chasing down literally anything that has the appearance of malfeasance in Hillary Clinton’s life, however thin it may be. AP accused The Clinton Foundation of participating in pay-for-play quid pro quo corruption, even though the facts don’t support it. Donald Trump and his foundation have openly, brazenly, and proudly engaged in exactly the kind of conduct AP was trying to desperately to prove in its story, and we have yet to hear anything about it.